Have you ever been really excited about buying something on Friday and then on Saturday morning you wake up, roll over, open your eyelids, and wonder …. What did I just do? That’s called buyers remorse and it happens all too often. 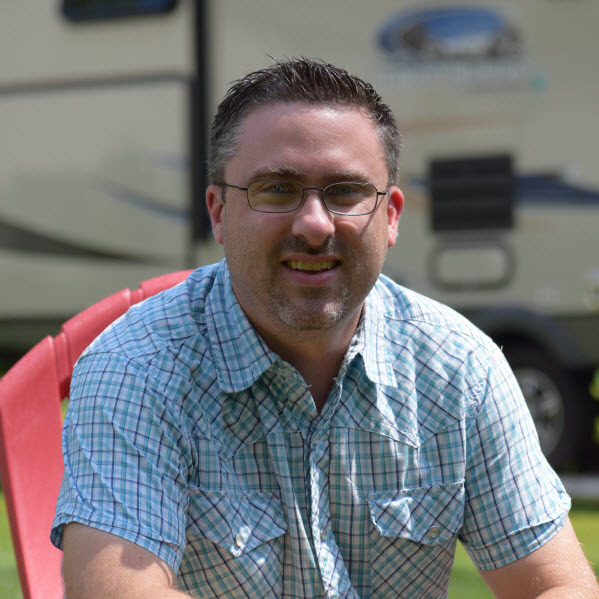 I want you to wake up the morning after your next RV purchase with a smile on your face and ready to get to the campground. Knowing your realistic towing weights, how to do proper research, and where to shop will help eliminate buyer’s remorse and keep you smiling all summer long. If you are going to be towing your next RV then as you search and find it you’ll want to know the weight your truck or SUV can SAFELY tow as well the TRUE weight of the camper you are looking for. To find your vehicle’s towing specs you can go to the RV tow rating guide. Finding out what your actual RV vehicle towing weight is actually pretty simple if you just know the RV towing weight terms. Gross Weight – This weight is the combined total weight of the Cargo Weight and the Unloaded Weight. Unloaded or Dry Weight – The weight of the camper as delivered new with installed options coming right off the manufacturing line. Hitch Weight – This is the amount of weight at the hitching point. For example a travel trailer may have a hitch weight of 375 pounds and your SUV may have a hitch weight limit of 425 pounds which means you are good to go. If those numbers are reversed, then the trailer is too much for your vehicle and cannot safely tow it. Typically, it is safest to use the Gross Weight when deciding on what your vehicle can tow. However, sometimes you can add less cargo to your camper and keep the actual towing weight lower. Whatever you choose … be SAFE and make the wise decision. TIP: Keeping your fresh water and wastewater tanks empty while traveling greatly reduces the towing weight of your RV. Don’t forget to empty before you hit the road! This part of the shopping process can be super frustrating and just plain wear you out. There are manufacturer websites, dealership websites, classified websites, rving blogs, and forums to find and try to work your way through. Towing weight, how much you can safely tow. Length according to your camping and storage needs. Number of slides, to give you roominess. Number of people for sleeping arrangements. The next step would be to narrow your search further based on floorplan styles. Start at RVingPlanet.com/rvs where you can filter generically by floorplan style or find a specific model. For example, if you filter for all Travel Trailers that have Bunkhouse and Outdoor Kitchen you will be shown every single travel trailer from every manufacturer that matches all in one place. No more hopping from one website to the next and trying to keep track of it all. From there, for each RV that you think might be a good match, go that RV’s specific manufacturer website to learn all about option packages, building materials, and warranties to help you finalize your decision. … many RV brands have more than 10 model floorplans? … most dealerships only carry a few models in stock of each brand? … rvingplanet.com is the ONLY website that has every brand and every model from every manufacturer all the time? Use rvingplanet.com/product to narrow your search, see what’s in stock for sale, then inquire about that RV from the closest dealer to you all in one place. Other sources to consider: rvt.com, rvtrader.com, rvusa.com. Shopping for a good used RV may require a bit more effort to find one that is truly a good fit and buy for you. Here are some good places to begin your search. TIP: Try using searchtempest.com. It allows you to search craigslist.com using distance by keyword. So, if I was looking for a 2014 Coachmen Freedom Express 29BHDS, I can go to this site, enter my zip code, leave the 400 miles range or change it, then type in a few of my keywords like 29bhds or freedom express to see what I can find. Beats searching craigslist region by region manually. Need help keeping track of your decisions? Want to uncover the pros and cons of new vs used? Want to make sure you get all the right questions answered BEFORE you spend your hard earned money on your next RV. The Ultimate RV Buyers Guide is packed full of buying tips, critical questions, helpful worksheets, and much more. Check it out.